Immunohistochemistry on Paraffin sections: 1/50-1/200. The human forkhead-box (FOX) gene family consists of at least 43 members, including FOXE3, a 288-amino acid protein. FOXE3 is a winged-helix transcription factor that plays a crucial role during the initial stages of lens development and closure of the lens vesicle. FOXE3 may also act as a factor that promotes survival and proliferation while preventing differentiation in the lens epithelium. As the posterior cells of the lens fiber begin to differentiate, expression of FOXE3 is limited to the undifferentiated cells coating the anterior surface of the lens. Congenital primary aphakia (CPA) is a rare developmental disorder caused by a null mutation in the FOXE3 gene that is identified by the absence of a lens. The development of CPA is normally stimulated during the fourth or fifth week of human embryogenesis. 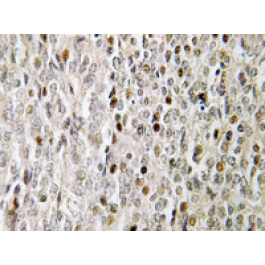 This antibody detects endogenous levels of FOXE3 protein.